Invergordon Boating Club in is inviting you and your family to come and try sailing for free on Sunday 27 May 2018. Whether you’re completely new to the sport or looking to get back on the water, RYA Push the Boat Out which takes place throughout May is the perfect time to give it a go. Starting at 10.30 there will be a whole host of activities taking place including dinghy sailing, keel boats and club ribs. For all the water based activities please dress warmly and have a full set of wind/waterproofs, old trainers will also be useful and do not forget to bring a change of clothes and shoes. There is a club house with changing facilities & showers and refreshments will be available throughout the day. Calling all members, there will be a combined Dinghy Keelboat cruise (race) up to Storehouse of Foulis on Sunday 4th. September. 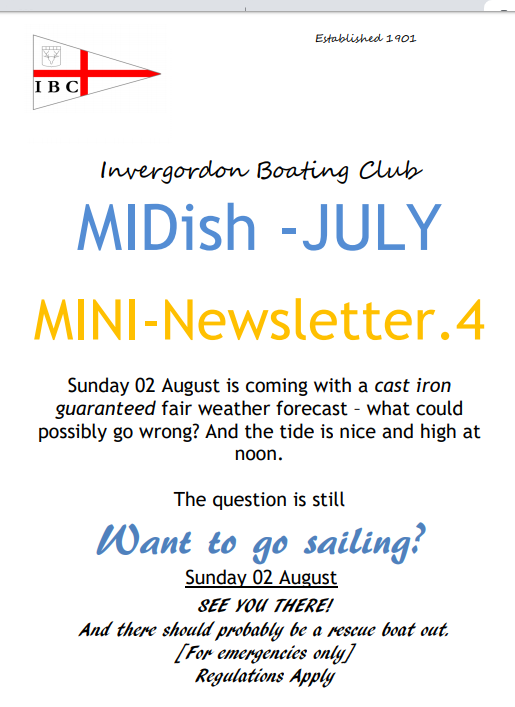 It will be one of the last chances for all to get out on the water, meet fellow sailors and have an enjoyable lunch. There will be safety boat cover and the whole event will commence at 12:00 hrs. High water is 14:58hrs. That should allow time for a relaxed lunch and some craick before heading back with the tide to the clubhouse.